Most festivals aren't generally known for being the most eco-friendly events. Think of all of the plastic cups used at just one event alone. Here at Indian Summer and Asbury Park Bazaar, our goal is to do things differently. We have partnered with the non-profit organization Clean Water Action to create a Reuse Revolution in Asbury Park! We are working with event sponsors Asbury Park Brewery and Sailor Jerry to Rethink DisposableTM and take steps towards reducing one-use disposables like Plastic and Styrofoam that end up clogging our beaches, oceans, garbage, and landfills with unnecessary waste that is also toxic to sea life. The 3rd annual Indian Summer music fest will feature amazing bands and DJs, including headliner The Dean Ween Group, beach camping, bonfire, yoga, as well as a makers market at the Asbury Park Fall Bazaar. This is all happening Saturday & Sunday, September 24-25th at the North Beach at the Anchor's Bend and inside the Grand Arcade of Convention Hall, 1300 Ocean Avenue, in Asbury Park, NJ. Purchase tickets. Asbury Park Bazaar reusable tote bag. We are excited to announce that Asbury Park Brewery is the official beer sponsor of Indian Summer 2016. They are providing souvenir reusable stainless steel cups. Event-goers can purchase the cups at The Anchor's Bend for $10 (includes your first draft beer) and then reuse the cups all weekend to receive $1 off on all drafts. You can also purchase the cup alone for only $5. The cups feature a detachable carabiner that you can attach to your belt buckle or bag so you won't lose it and can carry it with you all weekend. Be sure to fill those cups with plenty of delicious Asbury Park Brewery beer, made right here in Asbury Park! Our mission is to reduce the amount of plastic waste used at the event - we hope you will help us reach our goal. Sailor Jerry is our official liquor sponsor of Indian Summer 2016. They are providing Sailor Jerry mason jars and souvenir "oil cans" which will get you Sailor Jerry cocktails for a $1 off (only with use of Sailor Jerry reusable cups). These cups are free and will be given out at the bar. The Anchor's Bend restaurant is also reducing waste by replacing disposable food trays with reusable baskets. The Asbury Park Bazaar is also providing souvenir reusable tote bags. Stop by the concierge desk at The Market at Fifth Avenue on your way in to the bazaar and mention this post. The first 100 will get a free tote to put all of your goodies in on both Saturday & Sunday. 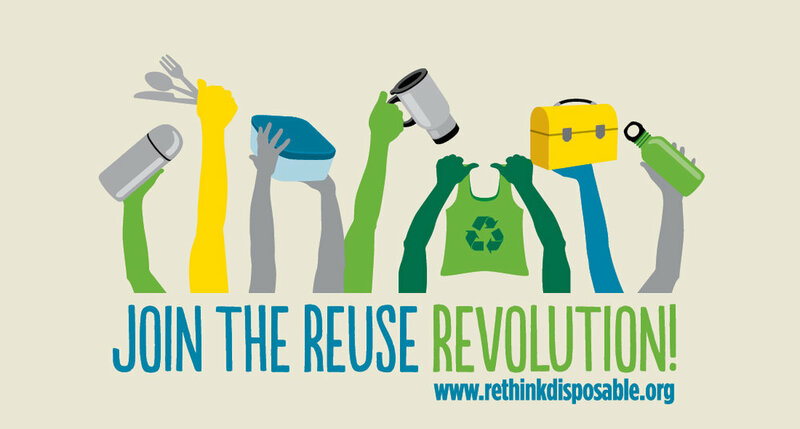 Join the Reuse Revolution - Take the Pledge! 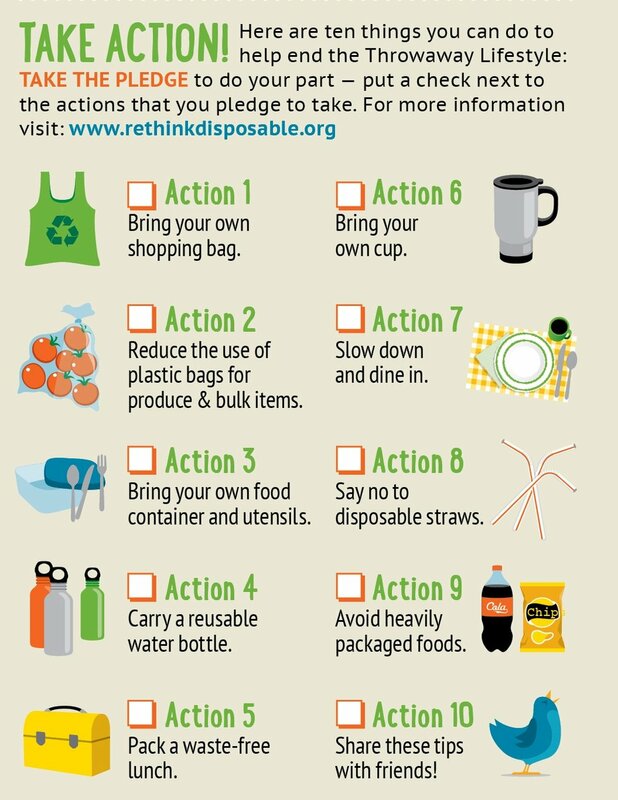 Be sure to stop by Clean Water Action's table on the way into Indian Summer fest (right next to the box office on the promenade at The Anchor's Bend) to take the Rethink Disposable Pledge and learn more about their campaign to reduce one-use disposable waste. There are so many things you can do to reduce your disposables footprint. Make a pledge to continue doing the ones you already do, and choose the new actions you are willing to commit to. Click here to take the pledge. Throwaway packaging litters beaches and oceans world-wide, piles up in landfills and contributes vast amounts of methane, and fills incinerators with dioxin-producing plastics. Our throwaway society has created an epidemic of resource consumption, waste, and pollution. Clean Water Action is taking-on single use products. They are targeting the replacement of all kinds of single use products with durable, re-usable alternatives. From shopping bags, to food and beverage packaging, to plastic water bottles, their goal is to minimize the use of single-use products. To learn more, visitwww.cleanwateraction.org/rethinkdisposablenj. Thanks in advance in helping us go green at Indian Summer and the Asbury Park Bazaar!